Simply Alert! is a supplementary feature that can be purchased as an add-on module to Simply Safety!. This program acts as an alerting service to warn you of time sensitive expiring items (including re-training dates, driver’s license expiry, re-inspection dates, etc) in the Simply Safety! database. 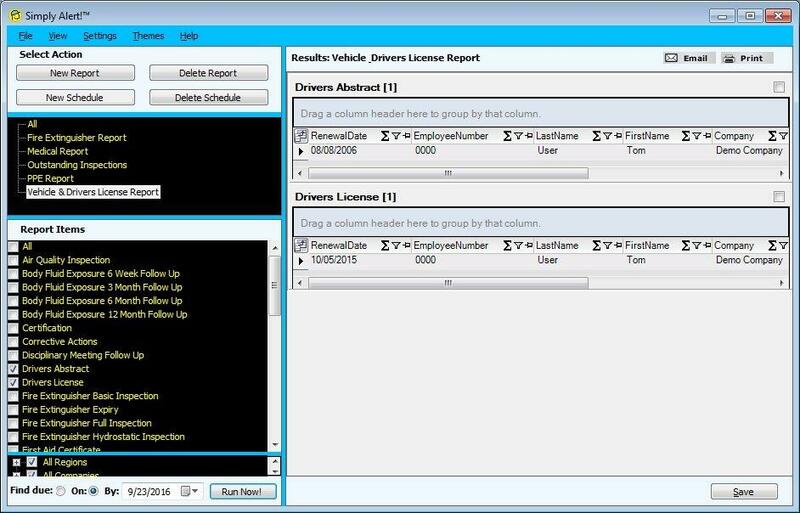 Create customized expiry reports on specific data, employees, regions, sites, etc. When the program is installed, a set of generic reports that may be of value are included. The Alert program also includes the tools to generate a new set of custom reports and schedule them to be emailed at a specific date and time. For instance, you may wish all training due for a specific site to be emailed to the site manager on a specific date each month or on a specific day each week.